Sworn depositions are now being formally made and subpoenas are circulating. This co-op has never been to the depth nor degree of difficulty as it’s in now. Never. The claims made by the president and the general manager of the Arcata co-op, claiming that the poor present economic condition of the coop – was the result of difficult business environment – is only partially true. 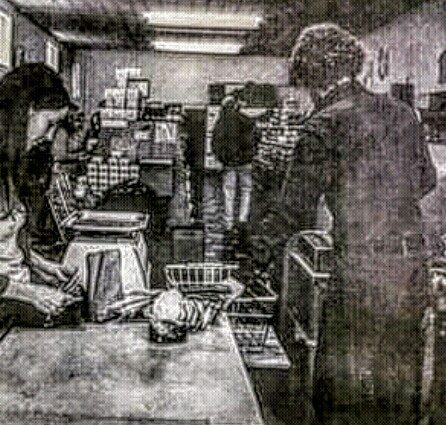 The local economic downturn explains the fall in overall income from the coop stores, only.. What has not been disclosed, and is deliberately obfuscated, is the fact that other incredibly poor decisions for hiring, training, and remodeling expenses, were made without ANY proper due diligence to read contracts, nor follow simple common sense. Imagine paying hundreds of thousands in cash for custom made equipment and training before you get a building permit or a construction loan. Hello ? This has NOTHING to do with business climate and EVERYTHING to do with gross negligence. Their ongoing mutually supported state of denial is only recently showing signs of cracking as evidenced by the request to their lawyer for advice. This is a good sign, actually, but late as hell. But how did they wind up in so much trouble ? I used to have this idiot cat who would fall asleep in some precarious position. Then inevitably, it would fall from a height, and – bonk! It would get up, look around, and then try to pretend that it hadn’t just landed on its head like an idiot. Trumpenhausen and those who surround her, (such as the president), don’t even have that much awareness. She’s so inept, and the people who she surrounds herself with are so inexperienced, that they don’t even realize when they incriminate themselves. Failure by the president, Colin Fiske, to investigate the terms of the contracts related to the remodeling and the training of dozens of employees – for a remodel that was neither legally permitted nor able to be funded – is the exact definition for acting in bad faith*. The protection afforded by the business judgement rule of California Corporate Law (CCL) does not apply – due to their lack of due diligence. Furthermore, the continuing state of bad faith shown through lack of reasonable oversight and review – demonstrated during the previous 36 month period – quite likely represents the necessary pre conditions for establishing a strong case for gross negligence under CCL. Gross negligence will not be legally defended from the slim coffers of the North Coast Co-op. It will be up to those individuals who are named as defendants to pay their own court costs, just like the poor employees bringing charges against them at this moment. The real heat on these two arrogant incompetants is only beginning to get turned up. This is sad news from one side, because heads must obviously roll for the situation in the management to improve. Since the guilt of lack of business diligence falls at the feet of Colin Fiske, who has shown such great enthusiasm for sustainable futures here in Humboldt, it demonstrates the lack of his understanding of the duties of seat he occupies. Perhaps the laws are different in Florida, where he recently moved from…? From the other side, at least it will prove to be a learning opportunity for him ! Yes Prog d. The only fly in the ointment is that the members/investors lost at least 400,000 dollars in the remodel – of – nothing, and that Trumpenhausen continues to draw a 110,000 dollar salary even though she’s only been good at firing talented people and drawing Labor Board investigations. Melanie is the most hideous business person I’ve dealt with in a 30 year career. She needs to be made available to the prison or water treatment industries immediately! Next The Ill Fated Ten Pin Gambit Is Down And Out ! Come Buy A Chair ! !